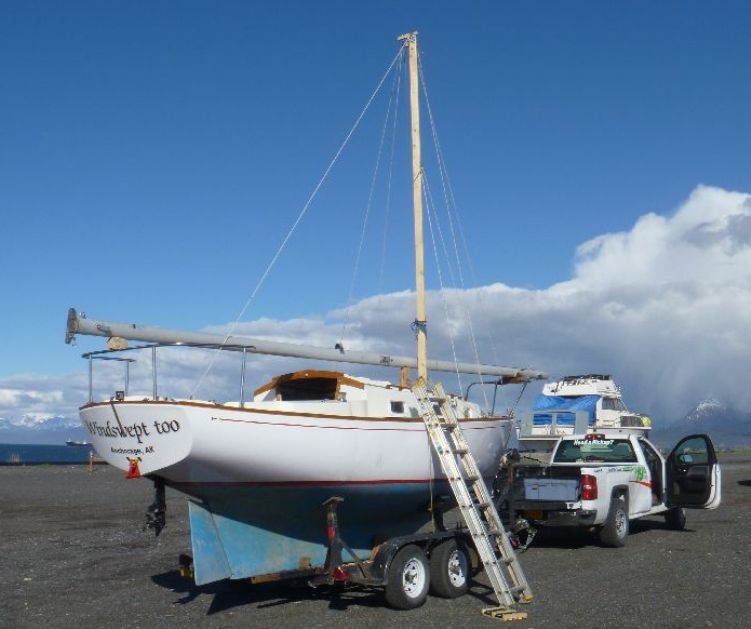 After having a bad experience ( see photo ) with lowering the mast last week I was motivated to come up with a better, more mechanically advantageous way to raise and lower the mast. Witness the birth of the boat crane. I am able to secure the crane in place alone and raise the mast alone with very little effort. 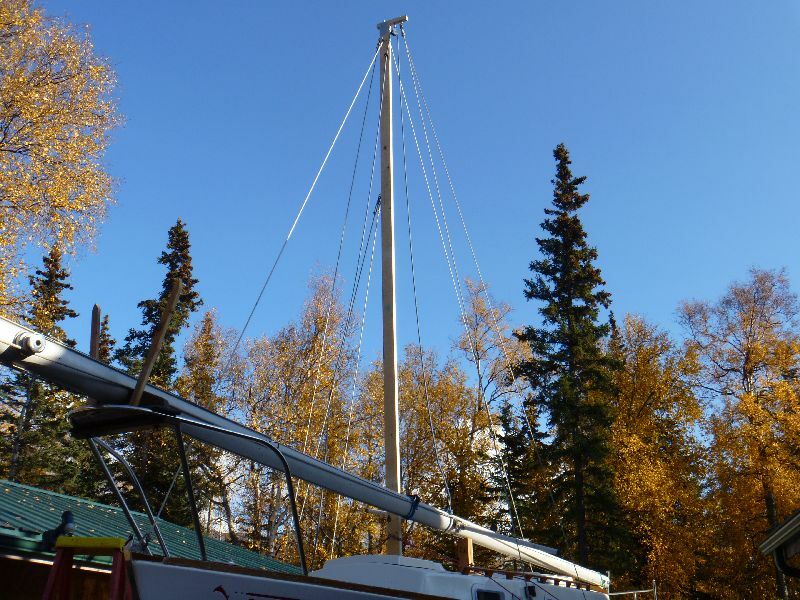 The mast is lifted straight up and it's weight of less than 100 lbs is easily handled by the genoa winch. I can stop raising anytime and tie the line off to the cleat and come back to continue with no fuss. I am presently making refinements to the system and will update with details and pictures as time and weather permit. 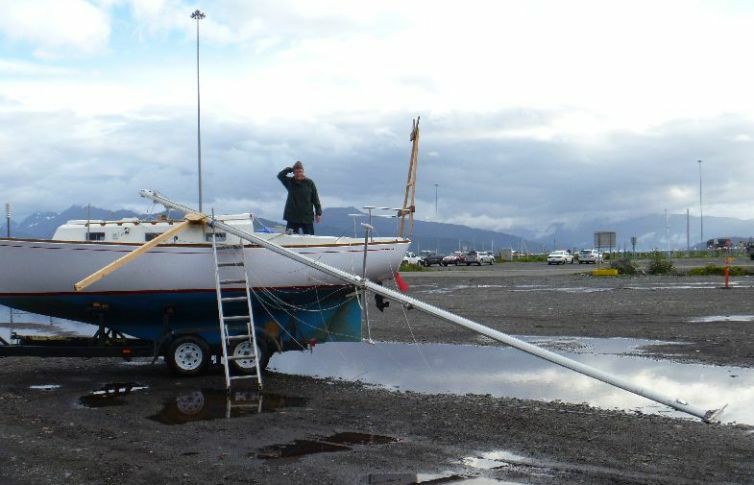 ps The mast was thankfully undamaged, unlike the mast base ( see picture below left). 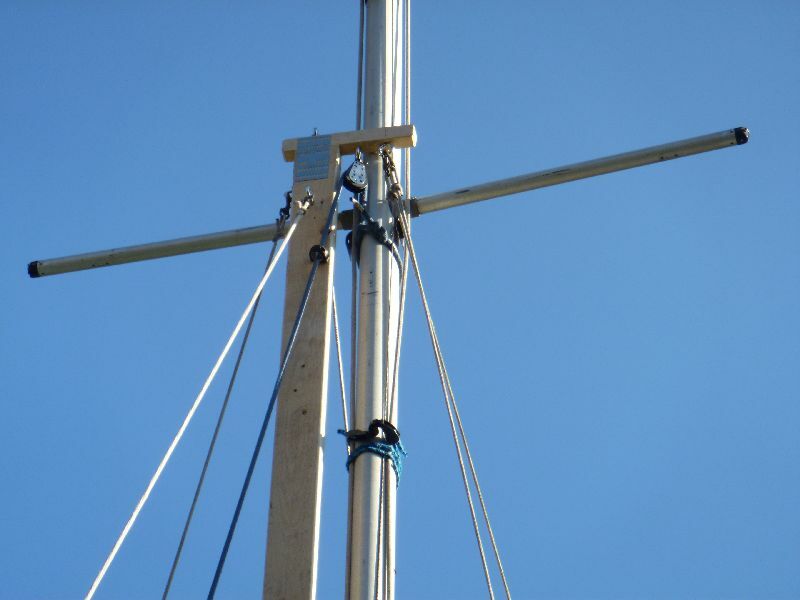 pps To add to the discussion, the only drawback I see with this system is that you have to climb a ladder or go up in a bosuns chair to the spreaders to remove or attach the crane lifting line, depending if you are raising or lowering the mast. I am quite comfortable with a ladder so no problem for me. Also, below right is a picture of the crane top, the blue line is the lifting line. This crane weighs about 20 lbs. This is the update on my mast crane. A few of the pictures I just sent may seem like duplicates of what I sent you before, but in the old pictures the spreaders aren't on the mast. 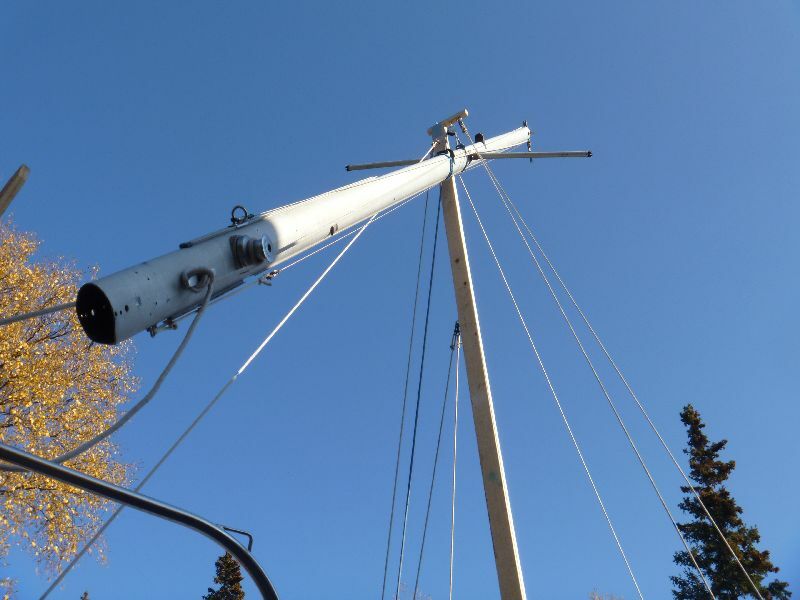 I raised the mast a few days later with the spreaders on to see if there were any problems that the spreaders caused but all was well. Also, specifics of the crane are: 4" x 1 1/2" x 16' spruce lumber. 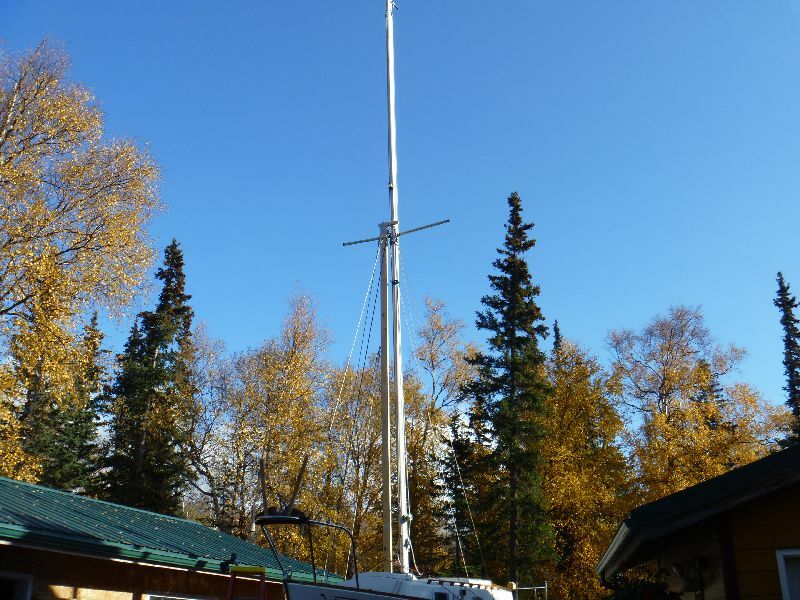 With mast top and base total height of crane is about 16' 3". Crane weight is about 23lb. I've looked at Mark Wagner's crane setup and am impressed with it. My system and his are different as far as how the crane is built and supported but the actual lifting of the mast is virtually the same. I feel that a crane is superior to the gin pole method because throughout the process you are working with a consistent mechanical advantage that gives the operator full control of the process. 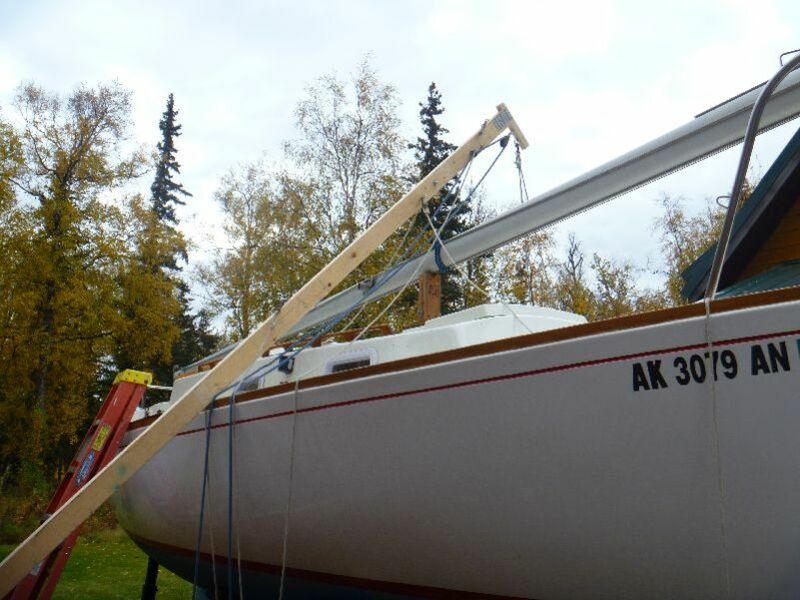 My mast is placed horizontally on deck with the base of the mast forward and top of mast at the stern. Both Mark and I use the genoa winch to power the lift, which it does quite easily and the process can be stopped and started at anytime during the lift. Marks crane is an A frame supported fore and aft with guy lines. My crane is a vertical post supported fore and aft and also port and starboard with guy lines. My system requires many more lines to stabilize the crane. I have one line each fore and aft. I have 3 lines on the starboard side and 2 on the port side. I also have 4 short lines which secure the base of the crane. All guy lines are fitted for proper length and have heavy duty dog line clips on each end which speeds setting up the crane. I lean the crane against the toe rail of the boat and secure the fore and aft lines and the starboard lines to the crane and also to the boat. 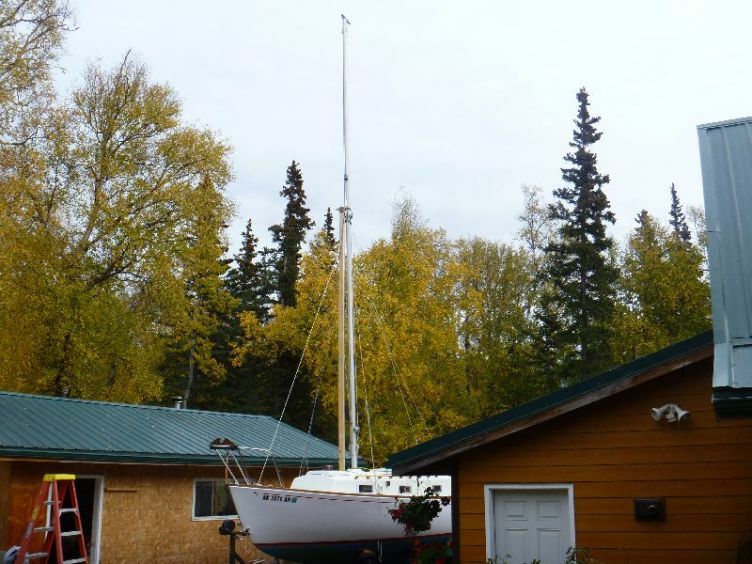 I then raise the crane and put it in place, slightly forward and starboard of the mast step. Then, I take the 2 port lines which are already attached to the head of the crane and attach their lower end to the port deck. Now the crane is stable. I add the 4 lines for the base of the crane and all is secure. The blue line in the pictures is the mast raising line. It is run to the head of the crane, through a block and down to the mast. It is attached to the mast just below the spreaders. The other end of this line is run down to the starboard deck, through a block and back to the starboard genoa winch. In the pictures the blue line is directly under the spreaders. 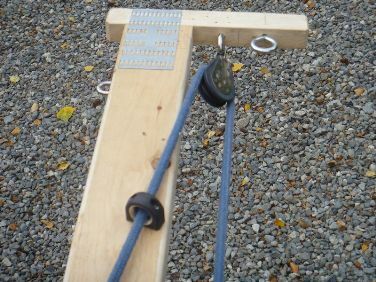 There is a blue bungie cord about a foot or two below the spreaders keeping the halyards against the mast, this is not the lifting line. Also, in one of the pictures there is a piece of plywood where the mast base should be. 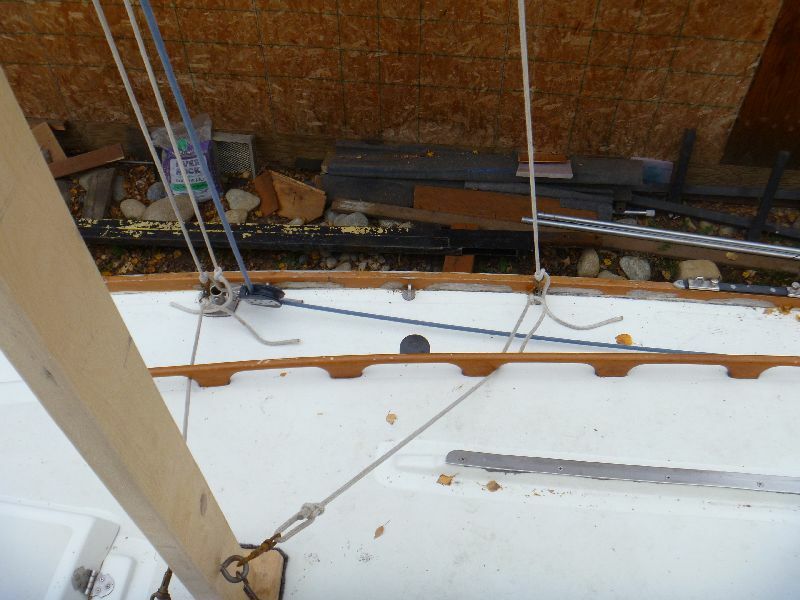 This plywood covers the hole left in the deck when the mast base was ripped out of the deck when we lost control of the mast trying to lower it with the gin pole method. I'm sure that the mast would have been severely damaged if the mast base had been thru bolted instead of screwed in. Up - view from the stern. The stern support line had to be moved to the very top of the crane head so as not to interfere with the starboard spreader as the mast was raised. 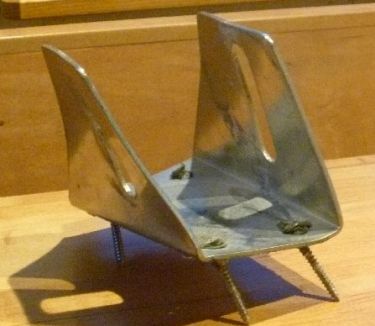 The bow support line (next picture) was ok in its original position. 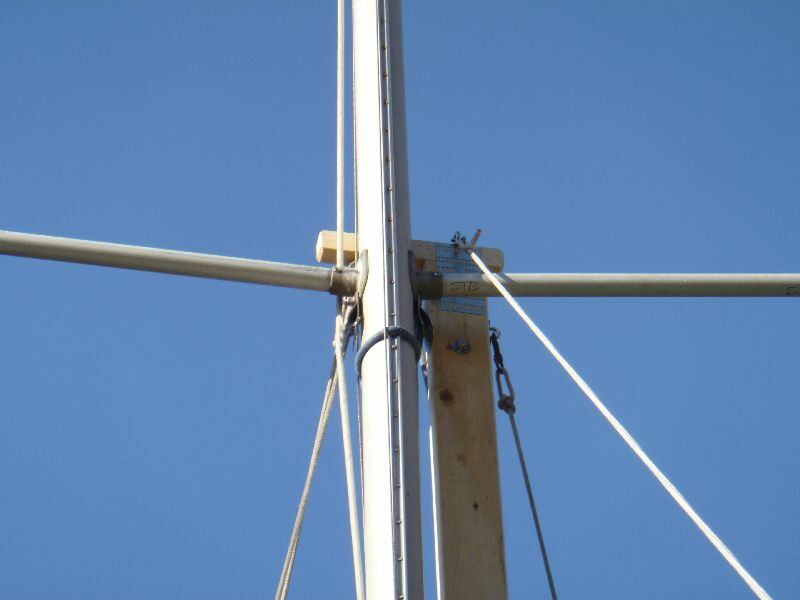 In the pictures of the mast in the vertical position the horizontal mast head is forward of the mast. The day I took the pictures I raised and lowered the crane and mast alone with no problem. When raising the mast I had to stop raising occasionally in order to get up and move the base of the mast if it got off line. Another person makes the lift go faster but is not necessary. I eventually tied a line to the base of the mast which helped me control it. May 4, 2017 - We got the following update from Paul. Finally after a long winter I'm scheduling my trip down to Seldovia and hope to launch May 19th or 20th. I've got a little update on the boat crane. 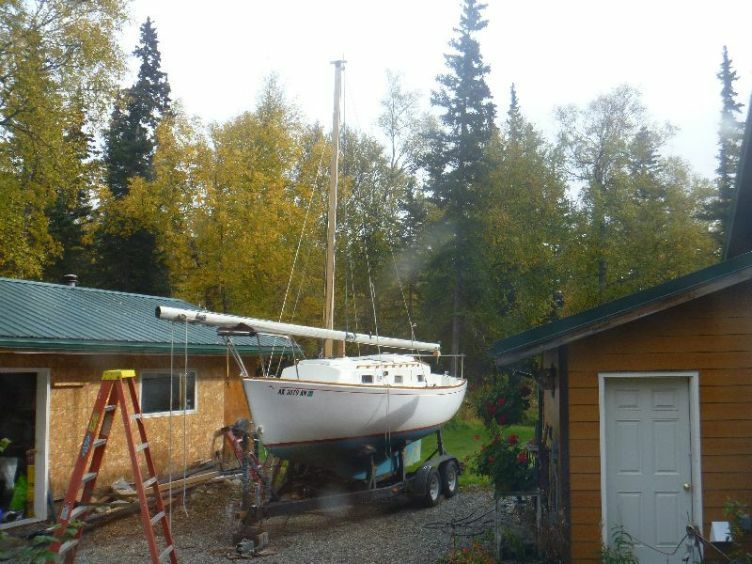 I had not yet used the crane to raise the mast with the standing rigging attached so I thought I'd try it at home instead of entertaining the good people at the Homer Marina. Well, I must admit that so far the crane is a smashing success. 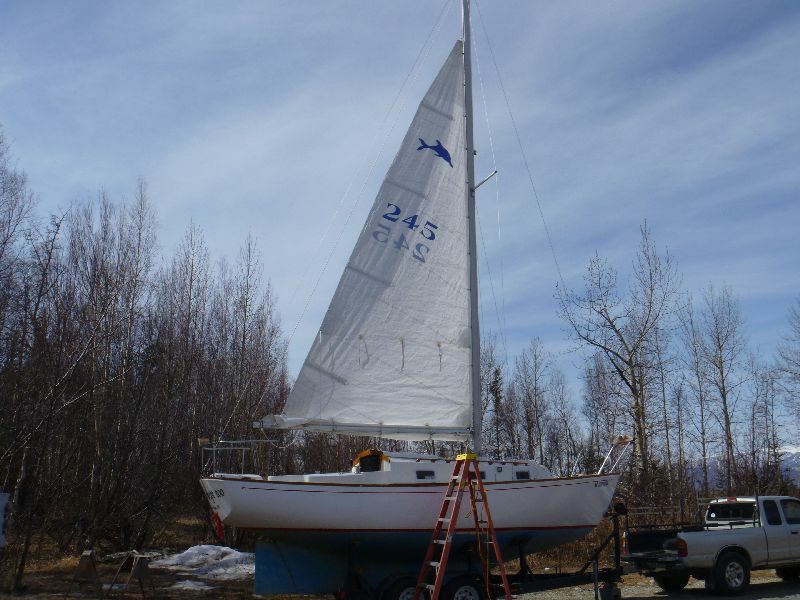 The only problem I've had is after raising the mast I had the forestay inside the upper shroud but on the wrong side of the spreader. The problem is that there are more wires and crane support lines than my brain was designed to manage. I now have a telescoping pole to correct this type of management failure. 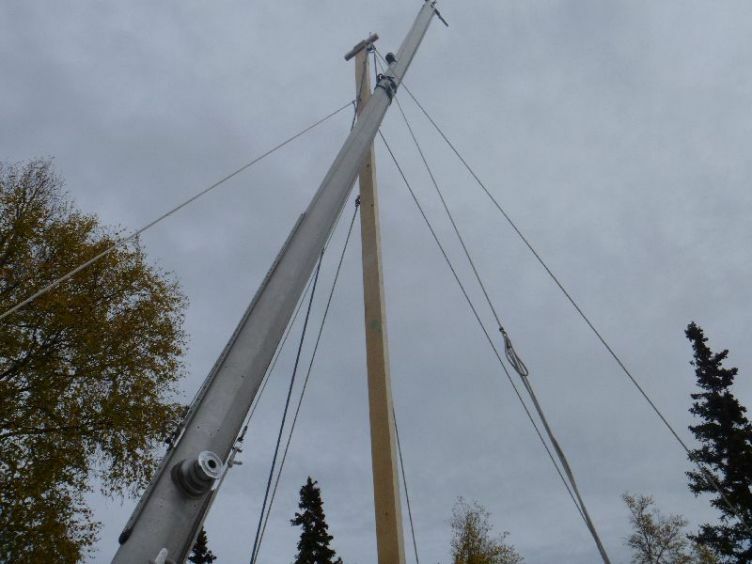 But the actual raising of the mast - and lowering also - was the easiest part of the whole process. 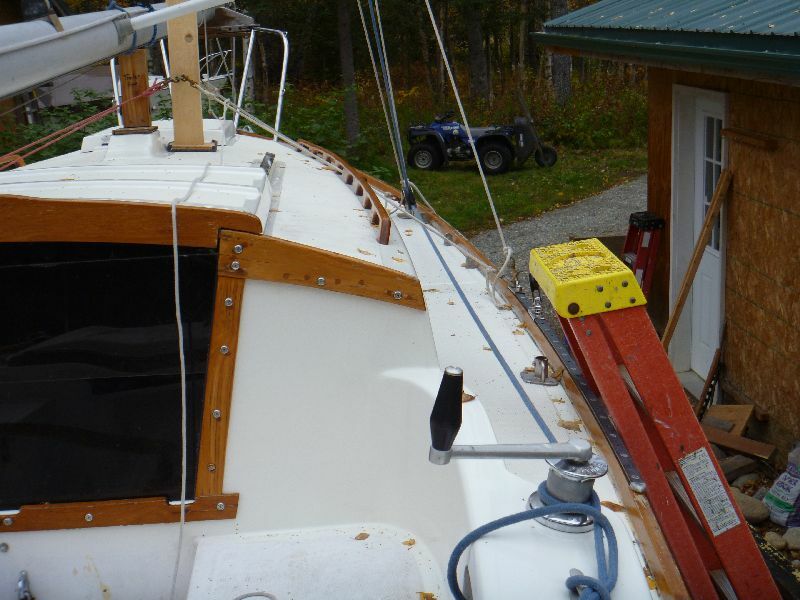 Another reason to raise the mast at home was to set up some new reefing lines, test out the new masthead sheaves I installed ( going from wire and rope to low stretch line) and install some lazy jacks. I'll update about the sheave replacement after testing them out, but I think they will be a real improvement. I wish you all a well deserved summer. I tested the boat crane solo this launch due to prior commitments of my helpers when I had to change launch dates because of foul weather. 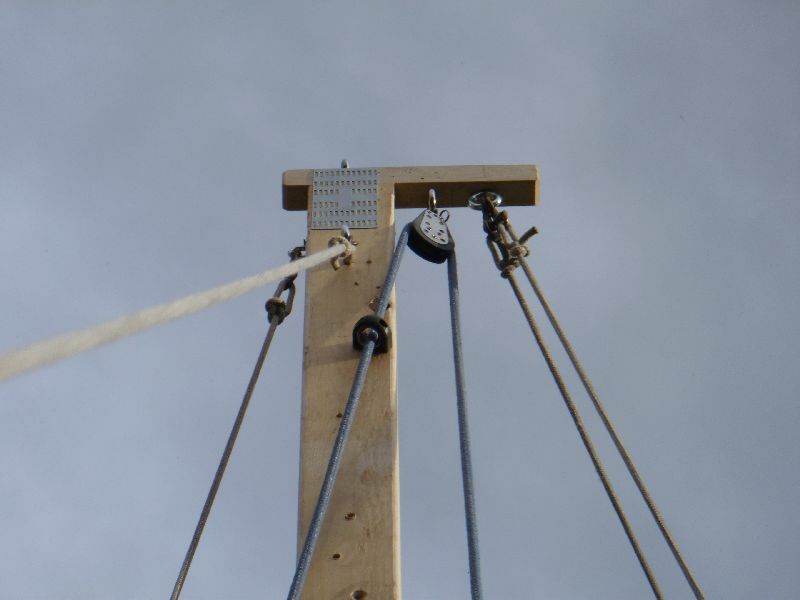 Other than some problems controlling the bottom of the mast due to windy conditions the raising was trouble free. I'm not sure what the solution is yet but I'm sure there is one. Piece of cake for two people. As with any mechanical system, the crane is as strong as it's weakest link so design it strong enough to handle the loads. Also, I got to try out the lazy jacks and they did a nice job of controlling the bulk of the mainsail on the boom. The downside, and I remember this from my larger boats, is that the sail can get hung up on the lazy jack lines when being raised in rough conditions, when pointing into the wind isn't always easy. It hopefully won't be a problem once I get the new tiller pilot set up.